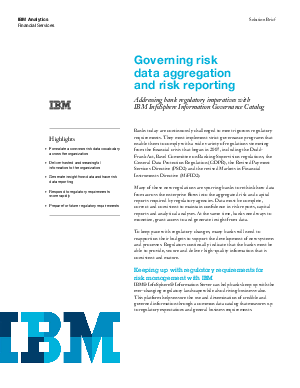 Many new regulations are spurring banks to rethink how data from across the enterprise flows into the aggregated risk and capital reports required by regulatory agencies. Data must be complete, correct and consistent to maintain confidence in risk reports, capital reports and analytical analyses. At the same time, banks need ways to monetize, grant access to and generate insight from data. To keep pace with regulatory changes, many banks will need to reapportion their budgets to support the development of new systems and processes. Regulators continually indicate that the banks must be able to provide, secure and deliver high-quality information that is consistent and mature.